The Wall Street Journal says the problem is that Obama killed entry-level work. In fact, the problem is that too much work only pays an entry-level wage. It's fairly amazing to write an article called "Why Young People Can't Find Work" that doesn't include the word recession or the phrase going to college, but the Wall Street Journal's opinion section is nothing if not consistently amazing, in its own way. So no surprise that in an op-ed in this morning's paper, Andrew Puzder, a restaurant executive, uses the question as a shoehorn to slip smoothly into a familiar criticism of Obamacare, which he blames for everything from depressing employment to destroying entry-level jobs. Rather than pick on Puzder, I'll pick on his shoehorn: Why can't young people find work, really? There are three reasons. Puzder notes that the BLS just recorded the lowest percentage of 16- to 19-year-olds working or looking for work since it started counting such things in 1948. 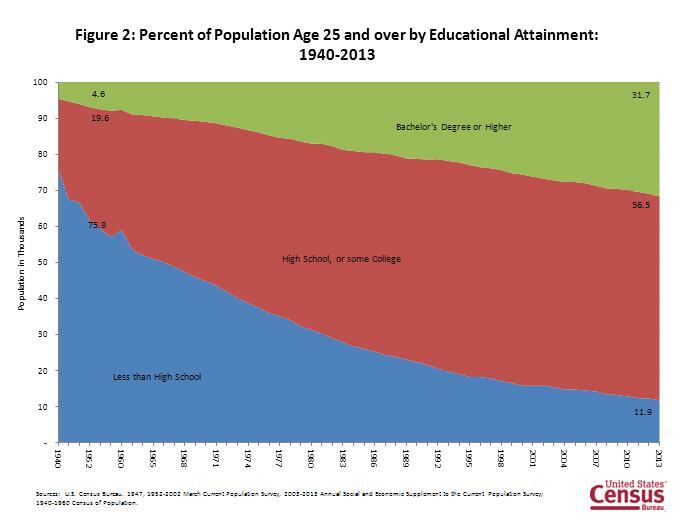 But look what else changed since the 1940s: The share of the population with less than a high school education fell from 76 percent to 12 percent, while the share of Americans with a bachelor's degree septupled to 32 percent. The BLS itself says that "the major factor producing this significant [change in labor participation] has been an increase in school attendance at all levels." The second reason that young people can't find work is that they're young. Young workers today are under-employed at high levels, but they've been under-employed at high levels for decades. Because they're young. Young people have long suffered higher unemployment than the rest of the country, unless they have a college degree. Because they're young. Graduates are moving from unemployment (school) to employment (workforce). Finding a job is always harder than keeping a job. The first thing you might see is that the overall youth unemployment rate (in light blue) hasn't budged from its historical average. There is nothing uniquely wrong with the youth job market. Youth unemployment is exactly as high as you might expect. The second thing you'll see is that there is something uniquely wrong with the job market for young grads who never went to college. Their unemployment rate is clearly elevated—a sign that a college degree is a necessary rung on the ladder to the quality career. Young people—including college grads—take time to establish themselves in the economy, and they always have. The most important concern today shouldn’t be whether they find work, but what kind of work they find. "It has become more common for underemployed college graduates to find themselves in low-wage jobs” since the 2001 recession, according to a recent New York Fed report. The problem isn't that Obama killed entry level jobs, as Puzder argues. It's that he lacks the power to enrich those entry level jobs.